I’ve never really liked that phrase about ‘revenge’… You know the one. It says it's“a dish best eaten cold”. 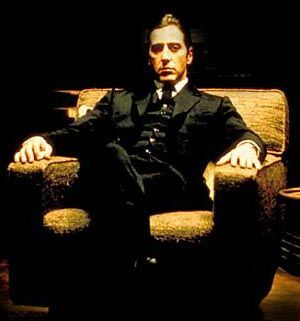 It implies a petty, small-mindedness and is often uttered by those with a Godfather complex who seek power for all the wrong reasons. But take a look at how H&F’s Conservative Administration has treated Threshold Housing Advice - the homeless charity. It’s hard not to reach the conclusion that the removal of all Council funding to that organisation is anything other than cold-hearted revenge that was plotted well before the last local elections in May. Threshold Housing Advice helps over 1500 people a year. Their clients are mostly homeless people who come to them when they’re in a desperate situation. Threshold have been operating in Hammersmith and Fulham since 1978. How then, did a small homeless charity upset H&F Conservatives? Regular readers will recall the truly horrific case of a pregnant woman who had been badly beaten up by her so-called partner. She went to H&F Council but was turned away after the Conservatives had tightened the criteria for offering help. The young woman was later found in a terrified state, sleeping in a park. This all happened just just four days before she was due to (and did) give birth. Threshold Housing Advice took that case to the Local Government Ombudsman. H&F Council was found to have acted illegally and paid significant damages to the traumatised woman. This story made the national press, the Evening Standard, TV news and the new media. The Independent later featured it in this polemic article. I’ve always believed that it is important to have organisations that are capable and prepared to tackle government bodies because government bodies can and do get things wrong. Councils, in particular, can be overly bureaucratic, unwilling to listen and incompetent. It is especially important that there are checks and balances when highly vulnerable people are the potential victims of these failings. That’s why most decent Councils provide funding for outside bodies to act as an important counter weight. Sadly for Threshold, that young woman wasn’t turned away for any of those reasons. Although the Tories deny this, she was turned away because of a political decision to spend less on helping homeless people by tightening the criteria. When Threshold successfully stood up for that young woman it embarrassed the Conservatives - both here locally and at a national level too. Their revenge was to seek to close Threshold Housing Advice down in this borough by removing all funding. H&F Council’s funding for the homeless charity stopped when that proposal was unanimously voted through by H&F’s Conservative Cabinet on 15th July. If funding is not restored Threshold will probably have to close down by this October. Threshold tell me that they actually have two more similarly horrific cases and that they have been pursuing H&F Council about them. One is much, much worse. If Threshold isn’t here to stick up for homeless people then what will happen to those local people who find themselves in such an awful plight? I think we all know the answer to that question. I call on H&F Conservatives to do the big thing and re-instate funding for Threshold Housing Advice. Revenge has no place in government. It reflects badly on the Conservative Party, here and nationally, that their politicians are prepared to treat some of the most vulnerable people who live amongst us in this petty and vindictive manner. Councillor PJ Murphy (Lab), the newly elected representative for Hammersmith Broadway has raised concerns about Tory sleaze at his first meeting of the Audit and Pensions Committee - which met last week on the 29th June. PJ was concerned to see that in the supplementary agenda the Audit “Committee is asked to confirm the appointment of Ms. Eugenie White as a nonvoting co-opted member”. It then ask members to agree to pay her £921 a year to attend just four meetings. Many residents will recall that, up until 6th May 2010, Ms. White (see pic) was a Conservative Councillor for Ravenscourt Park ward. PJ has worked as a human resources expert all over the world. 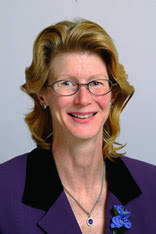 He rightly asked for an explanation of what skills and knowledge were missing amongst the current committee members; what the process was for encouraging a wide range of applicants with the missing aptitudes; how Ms. White was recruited or would fill any of the missing ability gaps amongst the Committee. No satisfactory answers were provided. Previously Hammersmith and Fulham's ruling Conservative Councillors have sought to give themselves unwarranted, inflation busting salary hikes, then the Leader of the Council tried to award himself a secret 14% salary rise. But this is the first time they have paid a non-elected Conservative larges amounts of public money. It seems that this age of austerity does not apply to friends of H&F's Conservative Administration. The Labour Opposition are seeking a review of this appointment and I will report back shortly. UPDATE: The Conservatives have responded to this but have tellingly only sought to take exception to our use of the word "bung". They say "a bung is a slang term for a bribe". I am very happy to confirm that we are not accusing Ms. White of seeking or taking a bribe or anything like it. I do not believe she would ever do that or (unlike some of her Tory colleagues) that she actively sought out this payment. Our criticism is aimed at the Conservative run Council. "Bung" is mostly a slang term for a "gratuity" or "tip" that would rightly be paid after a service had been provided. It is also defined as expressing how something is "thrown" or "slung" to someone. I have changed the wording in the title to clarify our position. To be clear: we are saying that the Council's Audit and Pensions Committee deals with investments worth hundreds of millions of pounds of public money. We believe that there are serious questions still to be answered about the recruitment process which led Hammersmith and Fulham's Conservative run Council to conclude that this particular un-elected Conservative is the most suitable of all the people available to sit on this extremely important committee and to be paid this large amount of taxpayers' money per meeting. H&F Conservatives now have a long record of finding new and creative ways to pay fellow Conservatives extra public money. I will report more on this later. Meanwhile, they argue that local people must suffer austerity, stealth taxes and cuts. All this is sleazy and the public deserve to know what's being done in their name. It is rare for great statesmen and women to make allegations of lies but David Cameron is a long way from proving he's anything close to resembling a great statesman. On the 22nd May 2010, our Prime Minister, gave an interview to Robert Winnett and Andrew Porter of the Daily Telegraph. In it Mr. Cameron sought to explain why his candidate had failed to win the Hammersmith parliamentary seat by saying Labour had made up "appalling" lies about the Tories' plans to demolish social housing and make the rest of it unaffordable for social housing residents. This is complete nonsense. There were no lies. 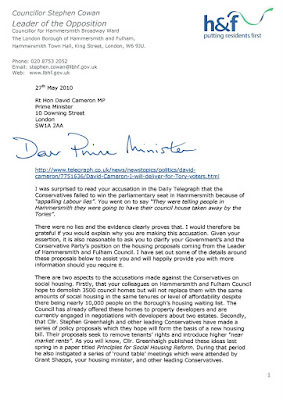 So, on the 27th May 2010 I wrote to the Prime Minister detailing why he is wrong and seeking an explanation along with six important guarantees that will protect the rights of the tenants and leaseholders under threat. You can read the letter here. I am yet to receive any sort of reply. I was surprised to read your accusation in the Daily Telegraph that the Conservatives failed to win the parliamentary seat in Hammersmith because of “appalling Labour lies”. You went on to say “They were telling people in Hammersmith they were going to have their council house taken away by the Tories”. There were no lies and the evidence clearly proves that. I would therefore be grateful if you would explain why you are making this accusation. Given your assertion, it is also reasonable to ask you to clarify your Government’s and the Conservative Party’s position on the housing proposals coming from the Leader of Hammersmith and Fulham Council. I have set out some of the details around these proposals below to assist you and will happily provide you with more information should you require it. There are two aspects to the accusations made against the Conservatives on social housing. Firstly, that your colleagues on Hammersmith and Fulham Council hope to demolish 3500 council homes but will not replace them with the same amounts of social housing in the same tenures or level of affordability despite there being nearly 10,000 people on the Borough’s housing waiting list. The Council has already offered these homes to property developers and are currently engaged in negotiations with developers about two estates. Secondly, that Cllr. Stephen Greenhalgh and other leading Conservatives have made a series of policy proposals which they hope will form the basis of a new housing bill. Their proposals seek to remove tenants’ rights and introduce higher “near market rents”. As you will know, Cllr. Greenhalgh published these ideas last spring in a paper titled Principles for Social Housing Reform. During that period he also instigated a series of ‘round table’ meetings which were attended by Grant Shapps, your housing minister, and other leading Conservatives. It is almost three years since I first uncovered information that this borough’s Conservative councillors were considering knocking down local council housing. Details of Cllr. Greenhalgh’s policy paper and round table meeting have been in the public realm for almost a year. So it is a concern that, despite all this and the high levels of publicity around it, the Conservative Party at no point took any measures to reassure residents affected by such proposals. Instead, it appears that your party adopted a damage limitation strategy and refused to provide any comprehensive answers to your political opponents, journalists or residents whose homes are under threat. 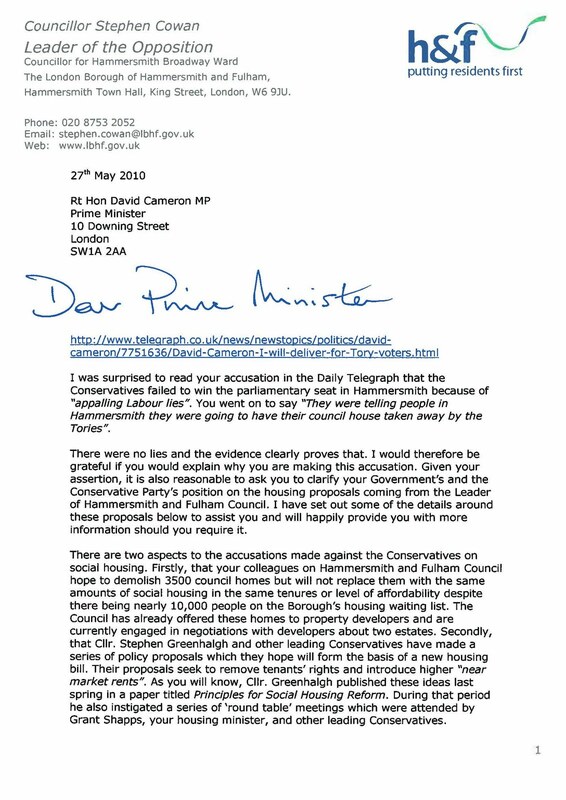 Indeed, you will remember that John Healey MP took the unusual step of writing to you about this matter on 28th July 2009 when he was the Housing Minister. Given the content of that letter, it was reasonable to expect you to categorically deny any accusations you felt were unfair and to clarify the Conservative Party’s position. In particular, he asked you to assure him that “changes to tenancy rights and changes to rent levels as set out in Cllr. Greenhalgh’s Localis paper will not become Conservative policy”. You did not provide those detailed assurances. Likewise, on 5th January 2010 you twice side-stepped residents’ questions on this subject when you visited St. Paul's Church, Hammersmith. You will recall that you initially answered a resident of the West Kensington Estate saying “There’s an awful lot of black propaganda being put about by the Labour Party and others.” When Maxine Bayliss, a resident of Queen Caroline Estate whose home is under threat, informed you that your Conservative colleagues on Hammersmith and Fulham Council had actually published a list of estates targeted for “redevelopment” you simply concluded that exchange by telling her "If you don't like them stand for election." Ms. Bayliss was right to ask you to look at Hammersmith and Fulham Council’s Local Development Framework as you would have been able to view the list of council house estates under threat and explain what that meant for Ms. Bayliss and many residents like her..
Will you guarantee that no government you lead will ever seek to end secure council home tenancies as they currently stand? Will you guarantee that no government you lead will ever seek to put social housing tenants’ rents up to market values or “near market values”? Guarantee that all tenants whose homes are demolished will be given a new, similar sized home, on the new development with the same rent and tenancy rights and will have an opportunity to choose their new home. Guarantee that no resident whose home is demolished will lose out financially or lose any legal rights they currently hold. Guarantee that all resident leaseholders whose homes are demolished will be given a new, similar sized, home on the new development at a rate they can afford. I appreciate that four of the six guarantees I seek are in the gift of the Leader of Hammersmith and Fulham Council. He has failed to offer those to date. As Prime Minister and Leader of the Conservative Party you are clearly able to obtain these. I am sure you will appreciate that people will indeed find that their council houses have been taken away if Conservative councillors are allowed to knock down much of the affordable housing in our borough, and then fail to replace it with more social housing of the same tenure and level of affordability. And, if any government you lead puts rents up to “near market values” then many residents currently living in social housing in high value areas would be forced to move away to cheaper areas. Given your assertions that the housing demolitions and loss of tenants’ rights are “lies”, I respectfully suggest that you are obliged to make sure that the housing proposals made by your Conservatives colleagues are stopped immediately.